Dr. Haddon has kindly given me this unpublished figure which he collected in Torres Straits. The native name is Nageg. First, Second and Third: The same as the tirst three movements of "The Well." Fourth: Release the loop from the right thumb and let it hang down in front of the figure. Put the right thumb away from you, under the middle of the upper string of the figure (Fig. 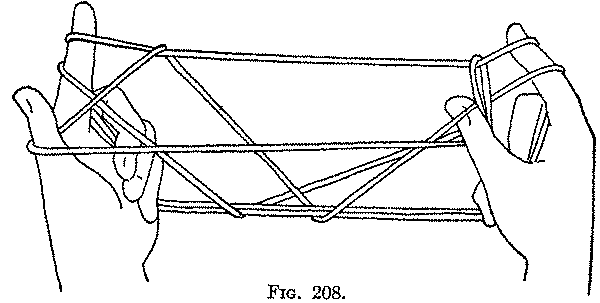 206), into the upper middle triangle and with the ball of the thumb draw toward the right palm the string forming the right side of the triangle and also the far string of the former right thumb loop (Fig. 207); then pick up from the right side on the back of the thumb the right lower near index string (which runs obliquely down to the lower strings of the figure (Fig. 208) and return the thumb to its position (Fig. 209). Fifth: Take the right thumb out of the loop and insert it again into the loop, but in the opposite direction away from you. Bend the right thumb down on the right palm and pick up with the back of the thumb the two right far index strings (passing from index to little finger) (Fig. 210) and draw them through the thumb loop which you allow to slip off the thumb as you return the thumb to its original position (Fig. 211). 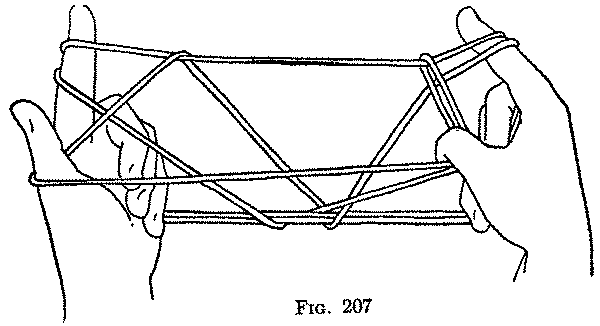 Transfer the loops held by the right thumb to the right little finger by inserting the little finger toward you (from below) into the thumb loops, and withdrawing the thumb; close the little finger down on the palm (Fig. 212). Sixth: Pick up from below on the back of the right thumb, close to the right index finger, the upper right near index string (which runs straight across to the left index). Withdraw the right index from both its loops and return the right thumb to its position (Fig. 213). 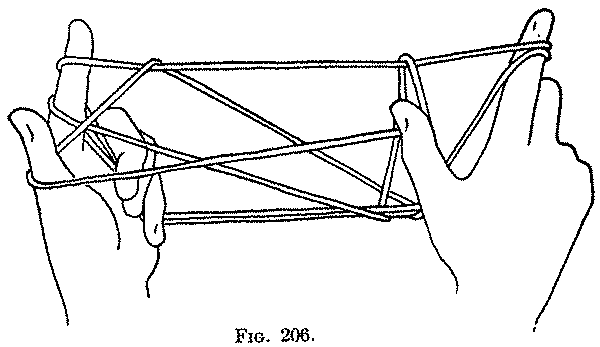 Seventh: Release the loop from the left thumb and let it hang loosely. 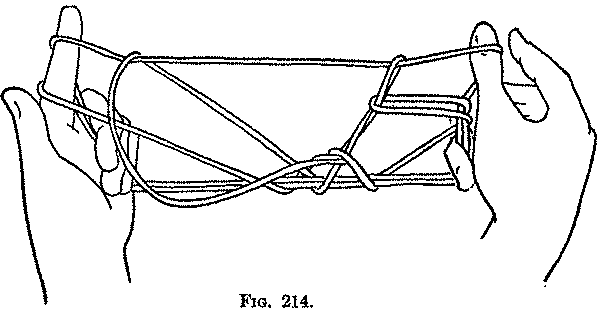 Do not draw its strings tight (Fig. 214). Eighth: With the left thumb draw down the left lower near index string (which runs obliquely to the lower strings of the figure) (Fig. 215) until it is below these lower strings and let it hang down; then pass the left thumb away from you over the two lower strings and pick up from below on the ball of the left thumb, to the left of the hanging thumb loop, the hanging index string (Fig. 216), and draw it to the left by putting the thumb against the left index. 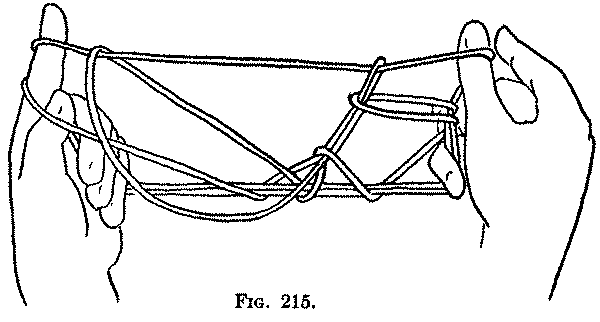 Draw the hands apart and the "Fish" is formed (Fig. 217). The "head" is near the right hand, the "tail" near the left hand and the "body," with the upright dorsal fin, near the middle of the figure. If the body comes out very small, it can be made larger by keeping all the strings in place on the left hand and drawing to the left, with the left middle finger, the crossed strings which separate the "body" from the "tail" and then again extending the figure. lT mo lbnFS mo 2bSS gr hN ml, arr. The only difficulty likely to be encountered in forming this very pretty figure is in the Eighth movement; if necessary, however, the left middle finger can be used to draw the hanging near index string away from you under the two lower strings of the figure, and into a position from which it can be easily picked up on the back of the thumb.